Family owned and operated, and under the guidance of Steven Perlmutter, past President and former Chairman of the Board of the Greater New York Kosher Caterers Association, Crystal Caterers has been serving clients on Long Island for 38 years at the South Huntington Jewish Center in Melville, NY. We offer the very best personal service with attention to every detail to ensure your event is everything you imagined. Get more for your wedding! 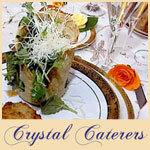 Don't forget to mention ChossonKallah.com when visiting Crystal Caterers.